Imagine a simple autofocus technology, produced at wafer scale using the largest semi-conductor MEMS fab, capable of producing very large volumes at high yield and high quality. Imagine that this technology replaces the current Voice Coil actuator used in your camera module solution, with improved speed, reduced power consumption, smaller footprint (e.g. large AMOLED screens with no dead zone etc), without degrading the optical performance. The solution exits: poLight® TLens. The TLens is the ideal solution for the latest camera phone applications, such as videos with continuous autofocus. The new poLight technology will be available in various aperture sizes and configurations. The released product is the TLens® Silver (see specification below). Imagine a simple autofocus technology, produced on a wafer scale level using the largest semi-conductor MEMS fab, capable of producing very large volumes at high yield and high quality. Imagine that this technology is suitable to replace your current Voice Coil actuator used in your camera module solution by improving its speed, its power consumption, its footprint and its robustness without degrading the optical performance. Today this solution exits: it is poLight TLens® . TLens® is the ideal solution for the latest camera phone applications such as videos with continuous-autofocus. The new poLight technology will be available in various aperature sizes and configurations. The released product is the TLens® Silver, see specification below. The TLens® Silver is available in two versions, the TLens® Silver without package and the Packaged TLens® Silver. The TLens Silver can be mounted on an existing barrel-type fixed-focus camera module, and is designed to support high picture quality and resolutions from 3MP upwards. It is compatible with up to 1/3″ sensor sizes. TLens Silver is not just a replacement of traditional VCM (Voice Coil Motor) technology for autofocus; instead it enables a range of totally new experiences, use cases and opportunities to build innovation. The TLens Premium has the same general capabilities as the TLens Silver, with extremely quick response time, low power consumption as well as small footprint etc, and is therefore suited for similar use cases. The TLens Silver Premium has, however, bigger aperture size that in turn allow for bigger sensor size and improved F-number. The TLens Silver Premium can typically be used for sensor sizes up to 1/2.8 ''. The Packaged TLens facilitates integration of a TLens on a fixed-focus camera module. It is designed to guarantee optimum TLens performance across all operating temperatures and storage conditions, and to withstand drop tests in line with the most demanding mobile phone specifications. Integrated in the TLens® manufacturing process, and minimising the steps needed for integration on a camera module, the Packaged TLens® is a cost-effective solution. poLight will deliver the Packaged TLens® fully function-tested with regards to focusing range and optical quality, resulting in improved manufacturing yield for the camera module. 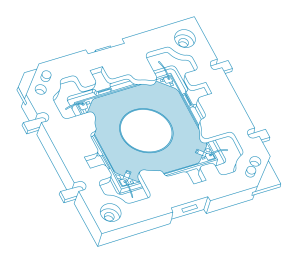 The Packaged TLens® is made of a metal insert plastic over moulding, wire bonding for electrical connections and structural bonding for mechanical performances. Top, bottom and side metal contacts, to allow easy electrical contact to FPC or other camera module electrical contact. The Packaged TLens® can be delivered with ESD and stray light cover, which, as an option, can be assembled at camera module level. The new Packaged TLens® may easily and efficiently be added to an existing camera module while optimising the performance of the camera module. The package is designed to fit most existing fixed-camera modules and to facilitate rapid implementation.